The 7:30 a.m. bell blared. 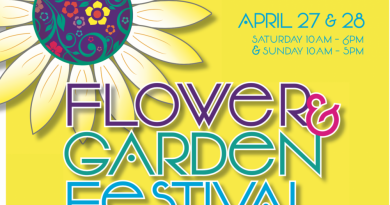 “Get ready, ladies. Here they come,” Cafeteria Manager Cathy Wilson said to her team. They took the cue to slip on plastic gloves and stand in position behind trays of food, just as dozens of students rounded the corner into the cafeteria to line up for breakfast. The hungry kids were greeted with “good mornings” on their way in and stickers that read “Wake up to breakfast at Frederick Douglass” on their way out. On a typical day, the Leesburg school serves about 175 students breakfast. Most schools don’t see such a crowd for what’s often referred to as the most important meal of the day. But Frederick Douglass administrators and teachers have fine-tuned the breakfast program to make it easier for more students to begin their school day with a full stomach. 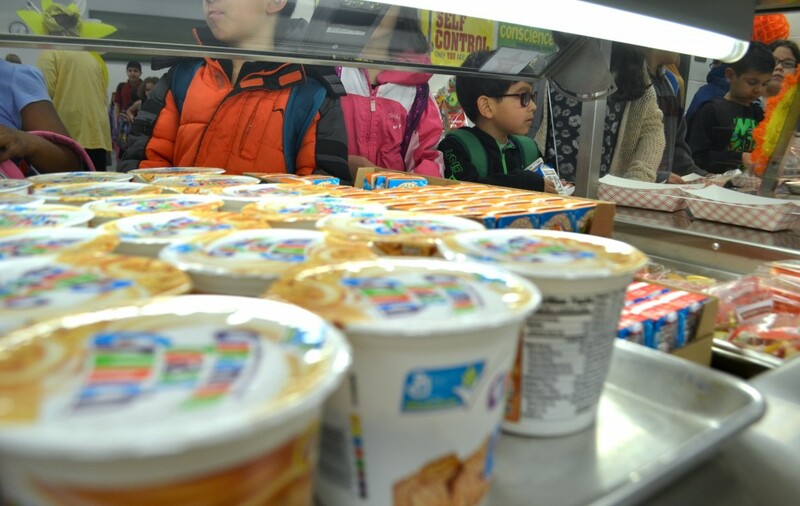 In the past year, Frederick Douglass has seen the number of students who eat school breakfast grow by 117 percent. The surge in participation was enough to draw a USDA administrator to belly up to the cafeteria table alongside students Thursday morning. Katie Wilson, deputy undersecretary for Food, Nutrition and Consumer Services, visited the school to celebrate School Breakfast Week and find out what’s luring so many students to make the cafeteria the first stop of their day. A little over a year ago, the cafeteria staff stocked more packaged foods and allowed students to grab food and take it with them to class. Then, word spread about the breakfast program as kids saw their classmates eating their meal during the first few minutes of class. Plus, students have more than a box of Cinnamon Toast Crunch as an incentive to come to breakfast. Kids who line up for breakfast have a chance to win prizes, such as stickers and breakfast with Principal Paula Huffman. Students throughout Loudoun County’s 88 public schools have, recently, gotten more of a nudge to eat breakfast. More middle and high schools have launched “grab and go” programs similar to Frederick Douglass’ and allowed students to eat during the first few minutes of class. Sugarland Run Elementary in Sterling has seen success in getting kids to eat when cafeteria workers deliver coolers of breakfast foods to the classrooms each morning. The changes have boosted participation in the breakfast program by 28 percent system wide, according to School Nutrition Services Supervisor Becky Bays. “Kids want fast, especially when you get to the middle school and high school level, and that’s made all the difference,” she said. Research shows that breakfast is tied to improved math scores and lower tardiness and truancy levels, Bays said. 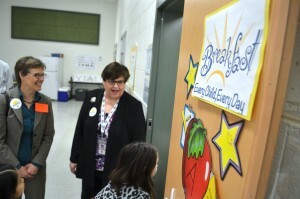 USDA’s Food, Nutrition and Consumer Services’ Deputy Undersecretary Katie Wilson and Loudoun County School Nutrition Services Supervisor Becky Bays greet students Thursday morning. About 31 million students nationally eat school lunch, and about 10 million participate in school breakfast programs. Throughout the country, the number of students who eat school breakfast is on the rise, Wilson said, but not quite to the degree it is in Loudoun. Wilson followed her own advice. She joined kindergartners for a round of breakfast pizza sticks—a favorite among Frederick Douglass students—before touring the school garden and visiting with fourth-graders as they planted vegetables. Breakfast in Loudoun’s public schools cost $2.10. Learn more about what’s served in the schools’ cafeterias at lcpshealthycafe.org.